California grows about 90% of the country's cantaloupe melons every year. Cantaloupe is grown primarily in two regions of the state- in the middle of the state, in a region called the San Joaquin Valley, and in the Southern portion of the state, in Imperial and Riverside Counties. Both regions have the right kinds of soil and the right types of climate to grow the perfect cantaloupe. California's farmers work hard to produce safe, affordable cantaloupe for us to enjoy. Part of their work is the responsible management of water used to grow a melon. Farmers rely on years of experience, modern technology and about 60 gallons of water to produce every cantaloupe we eat and they are looking to improve their technique every year. Farmers are careful with the water they use, as overuse can lead to wasted fruit that can't be sold and plant diseases that reduce the productivity of the plants. Learn more about how California's farmers manage water to produce our food. 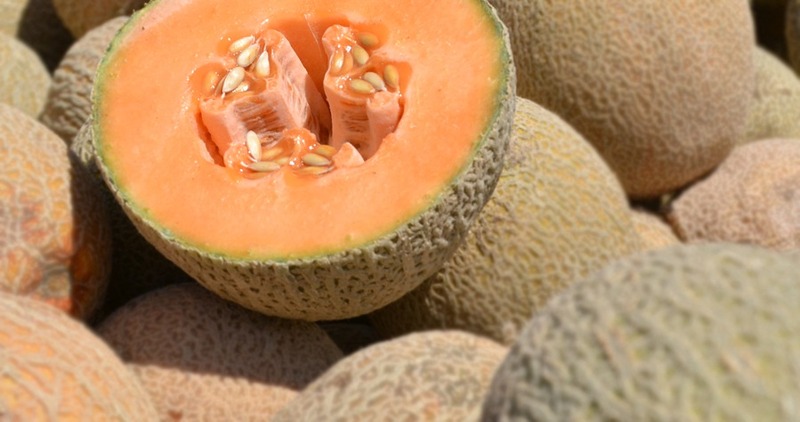 The cantaloupe harvest lasts from June until October- plenty of time to enjoy some fresh melons. Learn more about California cantaloupes at the California Cantaloupe Advisory Board's website.